Henry Kapono's Corporate Show is Live Bold and Exciting! Henry's rich blend of original compositions and popular songs gets everybody on their feet dancing to the sound of Global Aloha! Henry's musical career is one of innovation and creativity that continually evolves in a way that few artists are able to sustain. Influenced by many of the musical greats of all genres, Henry and his band of “Power-Hitters” bring it all to this Tropical Rock Concert. 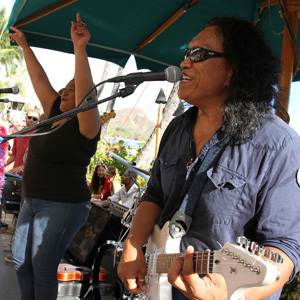 Over the past two decades Henry Kapono’s "Dukes on Sunday" concert performances on Waikiki Beach have become world re-known and a “must-do” on Sundays for visitors & locals alike. Henry's music represents PARADISE, combining the beach, the sea, Diamond Head and people from "all over theworld" as he brings this tropical party & dance concert to your event! He has won numerous Na Hoku Hanohano Awards (The Hawaii music industry's Grammy’s) including Male Vocalist of the Year, Song of the Year, Single of the Year, and Album of the Year. He is also the author of the award winning children’s book, A Beautiful Hawaiian Day, has appeared in major motion pictures such as Damien and Waterworld and has made many television appearances. Kapono travels and performs extensively throughout the world. He is a household name throughout Hawaii and the Pacific and his impressive list of compositions have become local standards, whether performed himself, or by other top performers. "Kapono never rests. He constantly strives to be on his own leading edge and has cotinually shaped the course of contemporary music in Hawaii.” says the Honolulu Advertiser's entertainment editor, Wayne Harada, who also named Kapono; "best Male Singer"...for his insatiable desire to be a step ahead of the crowd and his tireless effort to bring his music to a wider audience." Kapono really enjoys performing for his corporate clients and does such a good job that he is frequently asked to do repeat performances year after year. He has performed extensively over the past decade for clients such as; Hilton Hotels, Harpo Productions, Jaguar, Marriott Partners, Sheraton, Panda International, NCR, AG Edwards, Farmers Insurance, Harley Davidson, The NFL, AT&T Hyundai, Honda, Intuit and Humana, to name just a few! Kapono's Corporate Show is Live Bold and Exciting! His rich blend of original compositions and popular songs gets everybody on their feet dancing to the sound of Global Aloha! 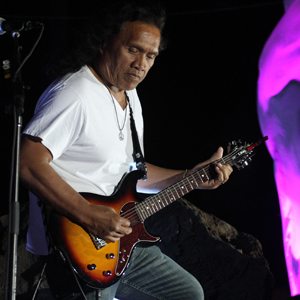 Kapono shares a Taste of Aloha with original songs such as Home in the Islands, Island Boy and Chillin’ on the Rock. He gets everybody to the dance floor with classics such as Mustang Sally, Hey Baby and Smooth along with favorite Island standards like Volcano, Margaritaville and Brown Eyed Girl and is notorious for getting everybody to sing along with classic rock covers from super groups like Fleetwood Mac, Lynyrd Skynyrd, The Doobie Brothers & Steve Miller! And for those who enjoy a little slower pace, he's right there with songs like his own Dreams and I Can’t Imagine That and Hawaii’s beloved classic, Over the Rainbow! From Ballads to Rock, Pop to Island Contemporary and Hawaiian, Kapono customizes each show to each client’s individual desires. Whether presenting a solo acoustic show or a Tropical Rock concert or dance party with Hawaii’s leading musicians, Kapono, a consummate professional, consistently delivers a powerful musical experience fueled with a positive “feel good” energy that is a MUST SEE and a night to remember in Paradise!